Monster Hunter World has a plethora of new monsters for hunters to tackle. 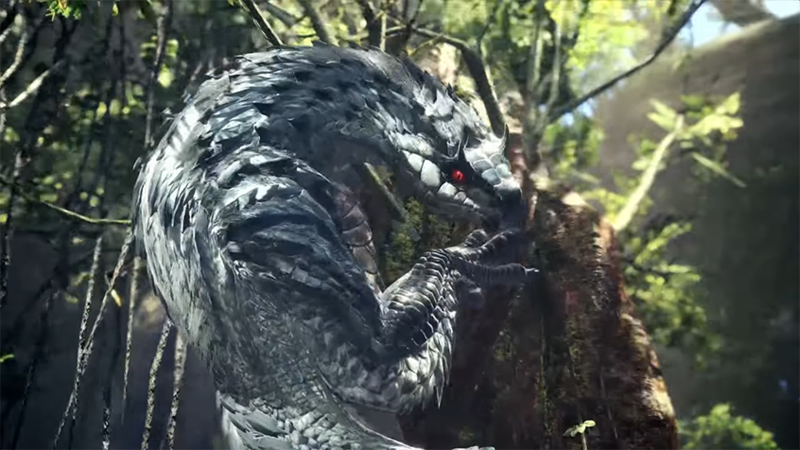 One of the most anticipated on the roster is the Tobi-Kadachi. This quick and nimble fanged wyvern can climb around the environment and easily dance around the hunter, making it tricky to land a solid blow. Here are some tips and tricks for taking it down. 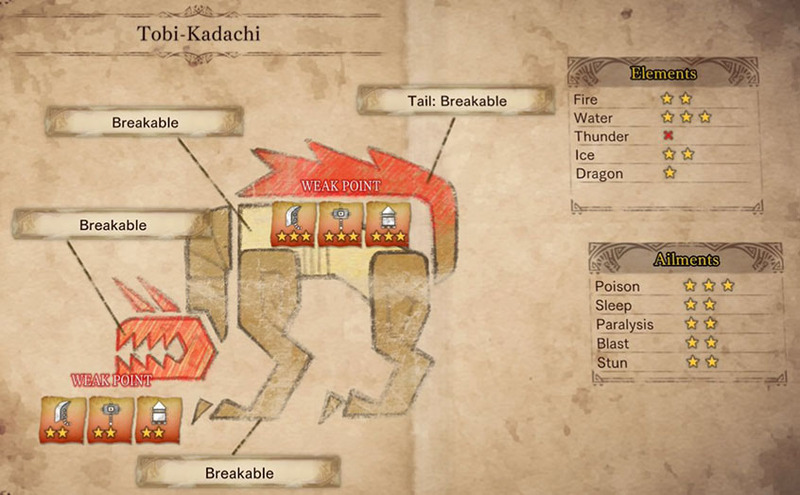 Tobi-Kadachi is one of the fastest monsters early on in the game. Striking a balance between being attacking aggressively and keeping a distance while the monster is dashing around is a key component to this fight. Don’t be afraid to back away from the monster while it’s moving around. Tobi-Katachi’s movements can be sporadic. Clearing some distance and waiting for the monster to slow down or tire out before attacking can help the hunter avoid damage from all sides. This monster also has a habit of climbing around its environment, and jumping from tree to tree quickly to find an angle to attack. Make sure to keep a close eye on Tobi-Kadachi while it’s in the trees to avoid a surprise attack from above. Like most monsters up until this point, the big danger areas on Tobi-Kadachi are directly in front of or behind the monster. 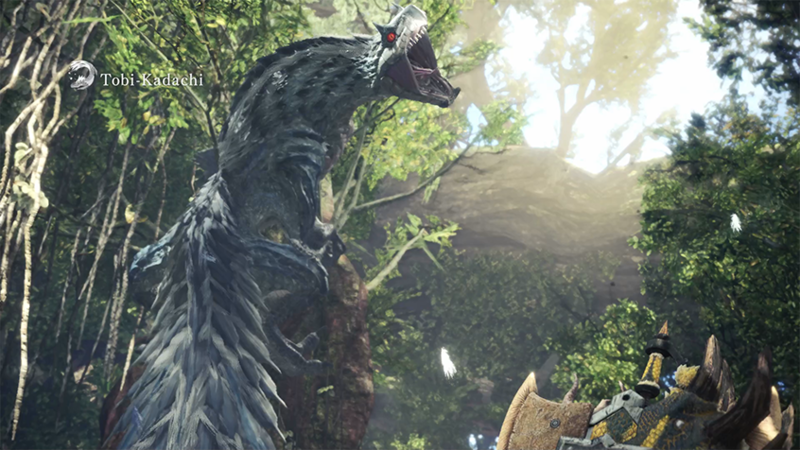 While in front of the monster, watch for Tobi Kadachi to lean back far, winding up while opening its mouth wide. This shows that the monster is about to charge forward a pretty significant distance with a bite attack. Two things can happen during this attack. 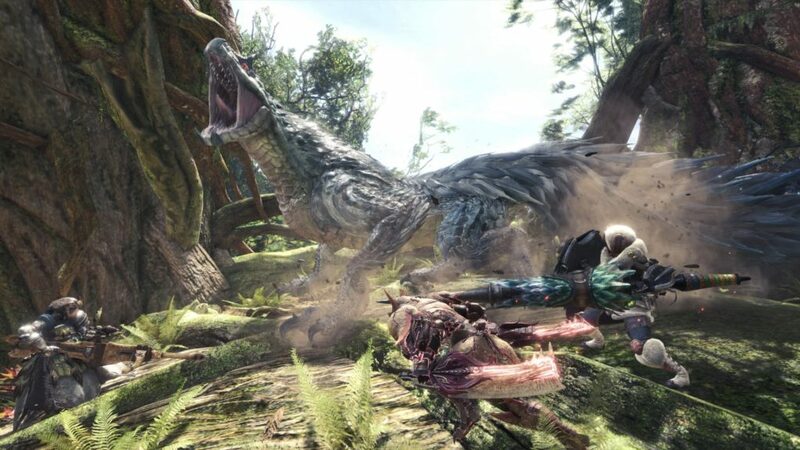 Tobi-Kadachi will either lunch forward directly in front of it once in a straight line, or the monster will lunge forward once directly in front of it and then a second time, changing direction towards its target. Both of these animations look similar, so the best thing to do is dodge away as far as you can to cover distance from a possible follow up bite. The other big hitting atack to watch for is Tobi-Kadachi’s flying tackle. The monster will crouch down for a brief second and leap into the air, spreading its limbs and fanning out its body to briefly slow itself down before spinning down towards its target. The animation for this attack is quick, but while the monster is in the air there is a brief moment that allows the hunter to dodge left or right to get out of the way of the attack. Lastly, while attacking from behind, the monster has a tail sweep which covers a fair amount of distance due to how long the tail is. The best way to prevent damage is to dive towards either of the monsters sides, avoiding the large arc of the attack. During the battle, the Tobi-Kadachi will stop every now and then and tense up while small streaks of electricity flow over its body. Once the monster has charged up, the hairs along its head, spine, and tail will stick straight up. They will be charged with static and the monster will start to glow slightly. At this point, Tobi-Kadachi’s attacks will do more damage and deal thunder elemental damage as well. Once hit enough with thunder, the hunter will contract the thunderblight ailment. This will cause the hunter to be very susceptible to being stunned or paralyzed by attacks. To get rid of thunderblight, dodge roll around 7 times or take a Nullberry. Having a stack of these will prove very useful during this fight. Stacking up armor and charms with thunder resistance will also be beneficial to the hunter. Tobi-Kadachi’s main weak points are its head and tail. The tail can be cut off and carved for extra monster parts, and every point on the monster except its hind legs can be broken. The monster is also weak to water elemental damage and can take decent damage from both the fire and ice elements. The monster also is susceptible to the poison ailment. Having weapons that put out any of these types of damage will put the hunter at a big advantage during this battle. Using a blunt weapon like the hammer against Tobi-Kadachi is a good choice for the battle due to the monster being so low to the ground. It is easier to apply big damage to the head and stun the monster, allowing an opening for big damage. Tobi-Kadachi’s speed may be intimidating at first but once the hunter has learned the timing and patterns that allow for big damage, the monster will go down in no time. The fight is fast paced and a ton of fun, and the weapons and armor sets that come from farming this monster are useful well into the game. Hopefully these tips and tricks will help hunters are helpful for hunters to take down this awesome monster.